Very little this time. Two years earlier we cycled Lands End to John O’Groats. For LEJOG, we had a strict training program and learnt the importance of good nutrition whilst cycling. Since then, we have kept reasonably fit by the odd 40 mile cycle and so decided that just a couple of long 60-80 mile hilly rides were sufficient training although with hindsight, perhaps more was needed for our bottoms. Our original intention was to take tents and camp for most of the way - cheapskates. However after checking for available camp sites, we found that 80% had closed by October. Oh what a shame. Comfortable beds with en-suite rather than the hard floor and cold toilet blocks. In the end, we used a mixture of hotels and B&Bs found through Logis de France, IBIS and the TIs in each town. Each was booked the night before or the same day. Costs were between €45 and €80 per night B&B. Not camping allowed us to take very little luggage and hence weight. 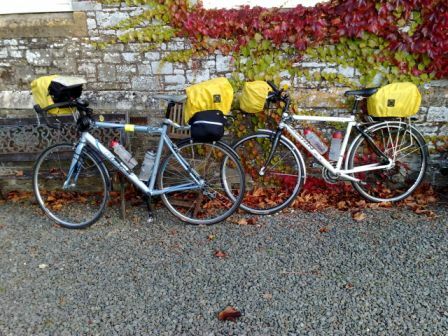 The photo shows our minimalistic bags – Altura fusion bar bags on the front and for the rear, Topeak RX trunk bag on Roger’s and Altura rack pack on Helen’s. In total, about 16 litres of space each. Condensing 2 weeks clothing into 16 ltrs space, along with all the maps, bike tools and food is quite an art but involves only one change of clothes for evenings, small lightweight shoes and washing clothes every night. Tip - squashing washed clothes in hotel towels is a great way to speed up the drying process. From our house in North Devon to Plymouth harbour to catch the overnight Brittany Ferries boat. This is a route we often do. 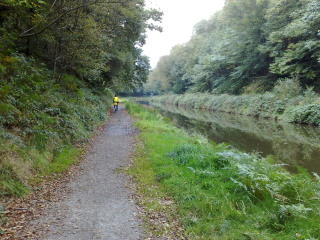 The 'granite way' cycle path from Okehampton to Lydford is worthy of a mention. We cycle this many times, but are still bowled over by its stunning beauty along the edge of Dartmoor. The cycle route along the old Plymstock railway from Yelverton into Plymouth is also useful. NE wind. The ferry arrives early morning into Roscoff. Follow the cycle path signs from Roscoff to St Pol de Leon then D769 to Carhaix. You know the movies of the Wild West, where a traveller enters a town and there is no-one, only barking dogs? This is how it feels cycling along the D769. There are almost no cars on the excellent road. The towns we pass are empty with many houses boarded up. Every 5th or so house is For Sale. Scenery is tree lined roads so a bit uninspiring. Our lunch stop is interesting. We wander into a pub/restaurant in the middle of nowhere to be met by a scene from the League of Gentlemen. We are about to enter when a guy with blood gushing from a cut face falls out through the door. It is dark, and full of beings who can only be decribed as the village’s collection of drunks and misfits who turn to look at us. Although it claimed to be a restaurant, no food to be had, only enthusiastic directions shouted by the crone behind the bar. This leaves baguettes, cheese and a ripe pear from the local boulangerie. 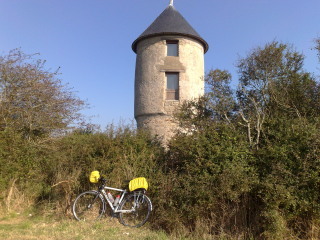 The accomodation is a B&B about 6 mls from Carhaix owned by an English couple who also sell soft fruit and dog food. Good quality with an excellent breakfast. In past years, many of their customers have been English people looking to buy a property in France. Since the credit crunch, these buyers are staying away. Dinner is a 9 mls return cycle to Carhaix to have our worst meal of the trip at a creperie. NE wind, mainly cloudy with a little rain. The post apocalypse mood continues today as we travel slowly (Ave 10mph) on the gravelly, slightly muddy tow path of the Nantes-Brest Canal – empty like the rest of Brittany (see photo at top). We see just one boat (stationary) a handful of fishermen and 2 cyclists, nothing more in the whole 30 miles. With an all terrain bike you would be laughing but the rain means trouble for road bikes. Our tyres pick up the mud, more like grinding paste, and gravel gets stuck in the brake blocks resulting in a ‘muckout’ stop every 5/10 miles. The same grit falls off the wheels and mudguards into the chain and gears storing up problems for later in the trip. The canal can feel a bit like a roller coaster in parts with 3m climbs every 100m for the continual locks. Lunch is in an excellent restaurant at Gouarec just next to canal turn right. Tip - if you see white vans lunchtime outside a Frence cafe, it will be good. 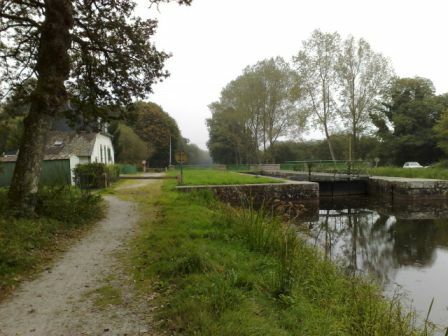 Between the Abbaye de Bon Repos at St Gelven and the Lac de Guerledan, the canal path disappears for a number of miles. The Abbaye looks to be worth a visit but we press on. 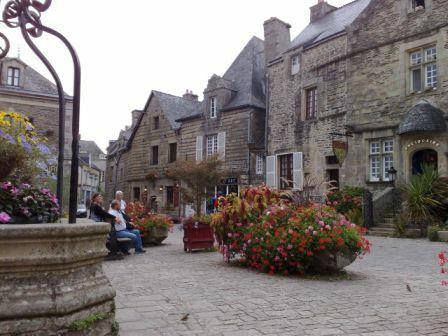 We stay in Pontivy, our cheapest night in a €45 B and B with a genial and welcoming hostess. The helpful Hotel de Tourisme (by the chateau) book this for us. 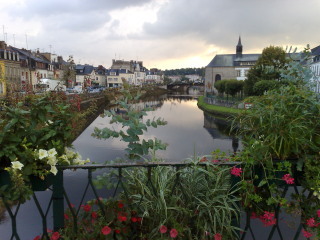 Pontivy has a scenic medieval heart and a pretty, flower filled riverside (see photo at top). 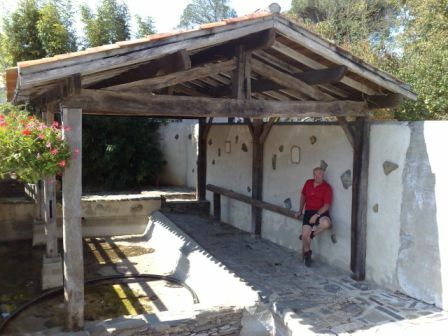 The heavens open during our walking tour and a Frenchman, out walking his dog, beckons us and takes us to shelter in an ancient riverside washhouse. We left England hoping for some sun but haven’t found any yet. Today has been between 13 and 18 degrees with a chilly north easterly wind and it’s rained nearly all day. Well, here comes the sun. It’s 13 degrees in the early morning mist rising to 22 degrees in the late afternoon. There is quite a bit of steep uphill climbing. The quiet minor roads we choose are wonderful but damned difficult to find. Signposting is, well, non-existant, and we get lost numerous times. Once again, we thank the GPS. 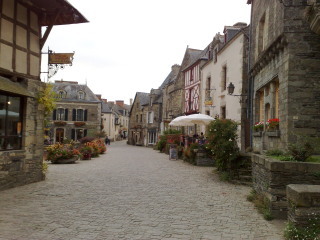 Josselin with its wonderful chateau makes a good lunch stop. The atmospheric and sunny central square is full of English tourists munching pizza. We are starting to worry that cycling is getting to be a bit like motorbiking. In the same way that every Harley Davidson has someone over 40 on it every cyclist spotted today has been over 50. They might have false teeth but being French, their lycra is ultra chic. Non matching tops, shorts and water bottles are utterly unthinkable. We still encounter ghost towns struck by the same virus which wipes out the population. The only thing alive seems to be barking dogs. We are their daily entertainment, ripe for a good chase and ankle gnaw. We are getting skilled at releasing our feet from their clips ready for a well aimed kick. The need for constant food is starting to wear off but we are still tired. Wind has been a moderate north easterly for the last few days. We climb 2800' today - odd, because it’s supposed to be flat but it’s pleasantly undulating, nothing too strenuous. Guerande good for a two hour lunch stop, not least for it’s free, unsecured internet (sad but we need to download The Archers and other radio 4 programmes). It’s a touristy, walled, medieval city with four gates with a sea salt panning area to the north and a few scattered windmills. We take the D247 and D47 out of Guerande towards St Nazaire. This is probably a mistake as the D 47 is fast and wide and fairly busy – not much fun. There is a cycle path to the coast and probably a coast route to St Nazaire but our maps are not good enough to find it. In St Nazaire, beware of following the coast too closely because you have to make a 5 ml detour around the extensive port. The bridge at St Nazaire is approached by a motorway which is downgraded to an A road for the bridge itself to allow slow traffic such as us over the Loire. In reality the drivers are still in motorway mode and lorries whizz past at 60mph. There is no cycle lane and the draft of the lorries plus the strong wind blows us all over the place and into the high concrete kerb at the side. It’s dangerous and frightening and with hindsight we would recommend walking up the bridge and cycling down. There is a separate narrow walkway just wide enough for a person pushing a bike. We stay in a Logis de France chateau, but being cheapskates and as we arrive in the dark, we choose a room without a sea view. Welcome to the servants quarters – probably one of the worst rooms we have had for some time. Breakfast, at €9 does little to redeem things – everything is burnt: burnt bread, burnt croissant, burnt pain au chocolat. The coffee is not burnt. Not too sure how we manage to climb the 1300' – it must be a large number of small hills because it’s essentially flat here. It’s more hilly inland but never more than 50m above sea level. This distinctive terrain is similar to the Essex marshes. We are in the seafood heartland with oyster beds and strange structures over the sea for some sort of fishing . All houses are single story so the villages are not especially characterful but the landscape with its big skies makes up for this. Many fields have cattle and most have a bull. Every 3rd or 4th field is growing sweetcorn which we are enjoying watching ripen as we head south. It’s a week or so from being ready to harvest here. We have lunch, (a superb, tomato heavy, pizza from the boulangerie in St Berniere) in an idyllic hot and sunny spot – the former town wash house of Soulans. Women used to come to this partially covered paved area with a stream running through to do their laundry and supposedly gossip. It makes a good spot for Roger to fall asleep on the slabs. The town also boasts an ancient wooden framed holding area with yoke where cattle were brought to be shod. It really is heating up now and suntan lotion is essential. St Vincent sur Jard’s Logis de France at €62 is very pleasant. The bedroom, a 1970s motel style garden room, is dated but comfortable. The large and welcoming dining room, as always, the only place in town to eat, is stuffed full of French, all dining very expensively on the very best and huge lobster/crab and other seafood platters ranging from €30-€62 each. Most drink wine at €25 upwards. Our more modest set seafood meal is €21 but is good. The lovely beach in a curved bay stretches as far as the eye can see with a few bungalows and our hotel. Down the road is a tiny carpark for 20-30 camper vans at €3 per night so you can cosy up to your neighbour 2mm away. This is a lovely, cloudless cycling day, our coldest start so far at 9 degrees, (a real shock to the system) but reaching a heavenly 22 – 24 degrees. Within 15 minutes of the sun coming over the trees we are shedding several layers. We have a thoroughly British weather obsession but minimal luggage makes for quite a challenge dealing with the variety of conditions. The easterly wind is slightly in our face as we travel south easterly. La Rochelle is a picturesque walled city and port, heaving with people. We use a couple of fast roads where we get up to 18/19mph, but mostly cycle paths where the top speed is 10/11 mph due to surface quality and number of people. These paths zigzag back and forth over a railway line and through sand dunes. Roger’s bike developes a click – bottom bracket starting to fail and Roger has a funny turn which he puts down to lack of food or salt. A big intake of coke and salty chips helps quickly. Route goes through gorgeous villages and populated resorts. It’s the first time we’ve seen anyone swim and use the beaches but it’s Sunday and it’s warm. We arrive in Rochefort too late to do it justice but it may be worth a return to see the inside of a fortified and enormous old rope making facility which looks more like a castle than a factory and is in superb condition. The ever reliable Ibis is our bed for the night, the bonus being their varied and plentiful breakfast, good if you are fed up with the bog standard croissant and bread (excellent though they always are). Have problems getting out Rochefort. There appear to be just two main bridges on busy A roads. The one small bridge for pedestrians and cyclists closes for servicing on Monday mornings – no warning of this until we arrive (so very French) so we backtrack. Shame because it carries its passengers in an interesting cage which is winched across the gorge. We cross the Gironde on the ferry from Royan to Pointe de Grave (€5 including bike, every half hour). The ferry port at Royan stinks. Oddly, the smell follows us onto the ferry accompanied by the sound of many howling dogs. All is revealed in the form of the hunt lorry, containing a complete hunting kit of dog pack and several horses. Royan is nothing like my childhood memory a backwater with the odd dusty campsite and equally dusty donkey - now it’s (over) developed in a modern high rise style – little charm at all. The D101 has a good surface allowing 18mph. It’s fairly quiet but we get the odd white van shooting past millimetres from our left shoulder so decide to divert onto a nice cycle path to the first beach resort of Soulac sur Mer. Cycle paths are generally very good. There is one next to the D102 which is of a much better quality than the road itself. We also try one of the WW2 German motorcycle routes (one of the better things the war left behind). These concrete tracks are narrow and were put there to patrol the endless miles of coast. We find a couple of signs to nudist camps but it is too cold to consider naked cycling. The beachs put Saunton Sands to shame – miles of clean sand and lots of surfers but the poor waves break close to shore – Devon is better! In the ordinary Vendaye Montalivet the only place to eat is our hotel where the soulless Madame seems determined to serve us only after all her locals. Not amused! 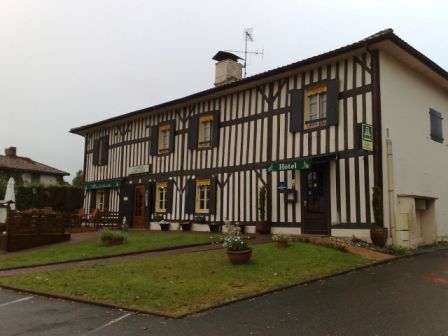 This Logis de France has excellent (but pricey: €70) rooms in a separate modern building. 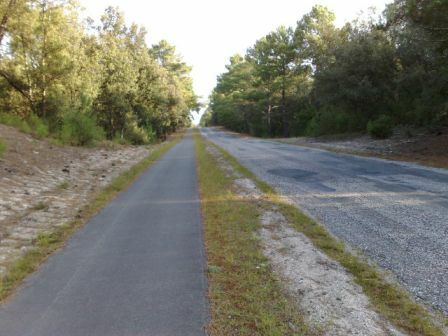 Compare the surface quality of the cycle path (left) with the road (right). 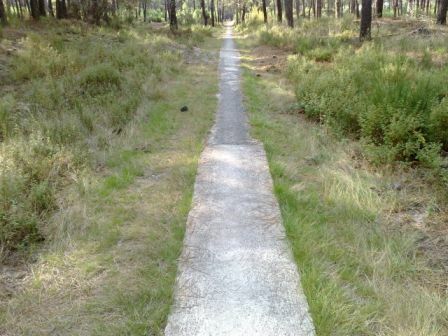 The Cyclepath to the east of the busy Arcachon basin keeps us away from the traffic but it gets a bit frustrating stopping for the dozens of local roads which cut across it and the many joggers and dog walkers. The road becomes busier as Arcachon is approached. Although we are cycling only a short distance from the sea, it is always hidden behind a row of houses. An even colder start today at 6 degrees. Tip for those with fingerless gloves: wear a pair of socks on your hands. Today is one of our most boring on a bike. We both feel a bit ill, perhaps due to what now seems like a lifetime eating sea-food but not helped by dead straight roads through pine forests for mile after endless mile. Try to go south after Biscarosse plage but are forced inland by the military zones around Barossa lake. The only interesting bit is Biscarosse village but we’re clutching at straws here! It’s cloudy today but a comfortable 17 degrees. The ghost theme returns with a two hour wait for our Logis de France hotel to open. We are the only residents and the only diners and seemingly the only people in the village. Come October, everything stops. The light drizzle turns to such heavy rain by end of day that the mileometer stops working. As it’s raining, Roger gets his usual puncture. Helen falls off her bike, shoves her gears into the wheel and bends the hanger. Arrive at the bike repair shop at 12.30 to find the mechanic has gone for his 3 hour lunch break. We spend time musing over what can he be doing! He hears of our dilemma, comes back early and 1 hour later has patched it up for a mere €14. What service. Gears now slip but may be in part due to wear on the chain and gears from the grinding paste picked up on the Nante-Brest canal. The traffic towards Biarriz is horrendous – fast and constant. No cycle path on RN10 which becomes A10. Roundabouts and traffic lights everywhere. It’s rush hour, lots of rain, visibility bad, many drivers on mobile phones. Don’t feel at all safe. We decide to take a train through Spain having heard that traffic only gets worse from here. Expensive here, especially restaurants €32-35 for menu du jour. Not the best of days so glad to find refuge in the Ciboure IBIS. In heavy rain, and strong wind, cycle to Hendaye on the Spanish border where the Spanish train line starts. The road follows the hilly, wild and stunning coast. Hendaye station is poorly signposted but is through the town, up the valley, going away from the seafront. There are two terminals on the same site, one servicing the Spanish ticket office is in a separate part of the station, to the left of the car park. The guy in the ticket office speaks only Basque and Spanish, not a word of French. No problem taking a bike on the train to San Sebastien, the only line. It runs every half hour for €2 each and takes 40min. One carriage has a place for wheelchairs where you can also attach your bike. San Sebastien – Bilbao (€9) is another pushpull line, leaving every hour and taking 2hr40m. Roger nips out of the train at the first of the many stops to move his bike into the wheelchair carriage – not quickly enough – the train leaves without him. There is no indication on the outside where to put bikes. Once in Bilbao you can get a city map from the helpful station TI to find a different station a few minutes ride across town for Santander. The helpful TI in Centre of Bilbao books us a superb 3* hotel close to the Gugenheim for €68. For €7.5 you can take one of only three trains per day to Santander. It takes 2 hours 50min, stopping every 3 minutes or so – very slow. Has 2 carriages only and space for bikes, again no clue as to where but the guards are helpful. 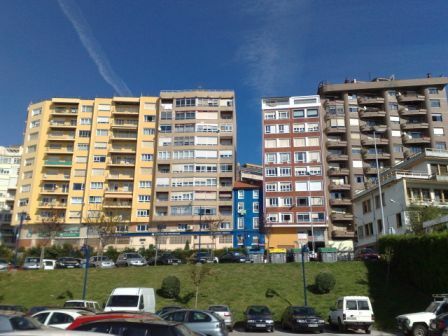 Santander is a bit of a dump, with some grand parts and a splendid beach – we should have spent a little longer in Bilbao. The train station is pretty central. 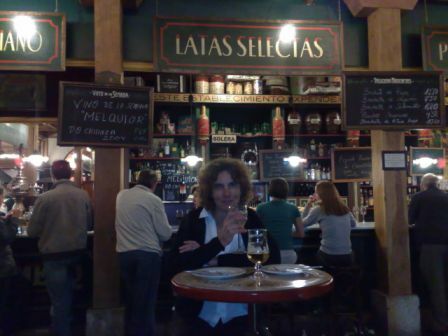 The TI on the seafront is closed but there is another hidden in an atmospheric old market (with good bars and tapas). This TI is open till late. Without the use of the TI, we only find a 2* hotel which is clean, has comfortable beds but is otherwise dire. 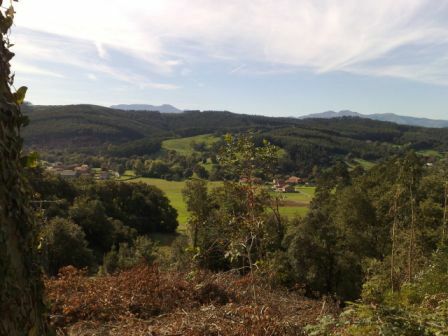 60 mile circular bike ride east of Santander. Take a quiet up and down route through foothills of the mountain. A helpful Spanish cyclist takes us 10 miles out of his way to the wrong place, but it’s Helen’s Spanish at fault. Getting in an out of Santander by bike is very difficult. All signs take you on the motorway and there are few other roads. There is a red route (623 perhaps) but almost impossible to find. Even nice roads suddenly end at a roundabout with the only exits being to the motorway. The landscape is more impressive than the west coast of France but the villages of modern apartment blocks are quite boring. It is hot today (mid 20s) and we are sweating in our thin clothes and shorts but the Spanish are wearing thick long sleeves and trousers. The countryside is worth a visit so to avoid the motorway, take the train out to the suburbs – cheap and easy. Easily booked by phone with their Spanish office. Tip: discount available if you ask for this to be treated as a return journey even though it’s from a different port. Need to quote outward booking reference number. Well worth the extra £15 for an outside cabin. Ferry terminal is very close to the railway station. Total distance for the trip, around 850 miles. On the whole the weather was good with a prevaling northerly wind. Early October is a good time to make such a trip, as long as you don't mind being the only ones on the French roads or in the hotels. We had a prevailing Northerly wind, and travelling South as the days became cooler was the right idea. Found this page useful? 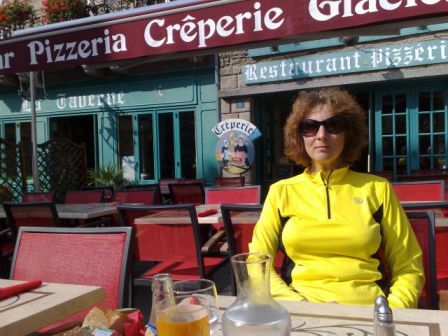 Why not cycle through France and raise money for charity at the same time. Have a look here at a charity that is supporting the Maasai people in southern Kenya. They are currently trying to build a school as well as clean water projects. All money raised goes to Kenya as there are no UK salaries or expenses.